Work is under way to distribute UK aid in the Philippines following Friday's devastating typhoon. The first UK aid flight has arrived, carrying almost 9,000 emergency shelter kits, while an emergency medical team and a Royal Navy ship are on their way. The British government has also pledged at least £10m, and the UK's Disasters Emergency Committee (DEC) has already raised more than £1.5m in donations. 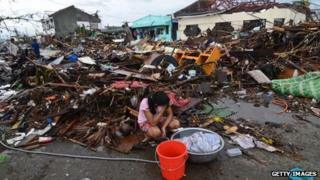 Officials in the Philippines say more than 2,000 people have died. President Benigno Aquino said the previous estimated death toll of 10,000 had been too high, and the number of people killed was more likely to be up to 2,500. The Philippines government said more than half a million people had been displaced. The DEC's 14 member charities all have "standing emergency funds" to "get things moving in the first hours after a disaster", a DEC spokesman said. Appeals are launched as quickly as possible, he said, but while that happens, charities can use reserves which the DEC can later replace. Once donations start coming in, the DEC examines the rate and uses its knowledge of previous appeals to estimate how much money will be raised. The spokesman said charities can then be told "roughly what they can expect from us". "They can actually commission a ship, a plane, pallets of food, tarpaulins or whatever they need on the basis that they know the money is coming," he said. Using this method, he said, charities can respond long before they receive the money they need to help people affected by disasters. The UK aid flight landed at midnight local time (16:00 GMT on Tuesday), carrying the shelter kits for people left homeless by the storm. The kits, which were flown from UK stores in Dubai and arrived at Cebu airport, contain plastic sheeting and rope. Officials from the Department for International Development (DfID) said each kit would keep a family of five sheltered. It will be down to charity World Vision, one of 14 aid organisations that make up the DEC, to distribute the kits. While several countries have deployed ships and aircraft to help those affected by the typhoon, many people are still without food, water and shelter. Aid agencies have warned the security situation is deteriorating and there are reports of looting, as those preparing to enter the disaster zone face logistical hold-ups. "There's a lot of work going on behind the scenes to make sure that when we're bringing aircraft in, they're the right aircraft, that the runway can accommodate them, that there's things like fuel so we can get them back out there," said Claire Durham, from the British Red Cross. "If we try and rush in too quickly, without any of this pre-planning, then we're going to have massive bottlenecks where aircraft are stuck on the ground and that's not going to help anyone." John Cordell, from the charity ShelterBox, which is delivering emergency shelters and supplies, added: "It sounds as though the security conditions are getting a little bit worse. There've been reports of attacks on food convoys and looting of aid. "I think that is deterring a lot of aid agencies from getting in there." DEC chairman Salah Saeed likened the destruction in the city of Tacloban, which was particularly badly hit, to that seen after the devastating tsunami of 2004. "There is currently no food, water or electricity. We can only imagine how much worse the situation will be for families living in towns and remote villages," he said. International Development Secretary Justine Greening said the 12-strong UK medical team, sent at the request of the Philippine Department of Health, consisted of "volunteer surgeons, doctors and paramedics who are expert at operating in emergency situations such as this". The team, which was expected to fly from Heathrow Airport on Wednesday morning, will be led by professor of international emergency medicine Anthony Redmond, of Manchester University. Later Ms Greening is due to host a meeting to discuss the international response to the ongoing disaster. She will be joined in person or via video link by representatives from UN agencies, donors and other organisations. The meeting is expected to focus particularly on how to help women and girls affected by what the Philippine president declared a national calamity earlier this week. Meanwhile, British ship HMS Daring, a Type-45 destroyer deployed near Singapore, is due to arrive at the disaster area on Saturday. The ship's captain, Angus Essenhigh, told the BBC its mission would be to provide "life-saving assistance" such as water, shelter and food. A DEC appeal was broadcast on Tuesday evening. The committee said £1.5m had been donated so far through its website alone, and a revised figure was expected later. A spokesman said the public "have been unbelievably generous" and the figure was "going to be high". The Salvation Army is also running an appeal. The UK government, which has already pledged £10m in aid, said it would match donations to the DEC appeal pound for pound up to £5m. It said its overall contribution would help to get food, aid and shelter to a total of 800,000 people. The UN has launched an appeal for $301m (£190m) to help relief efforts in typhoon-hit areas. The charities that make up the DEC are Action Aid, Age International, British Red Cross, Cafod, Care International, Christian Aid, Concern Worldwide, Islamic Relief, Merlin, Oxfam, Plan UK, Save the Children, Tearfund and World Vision.